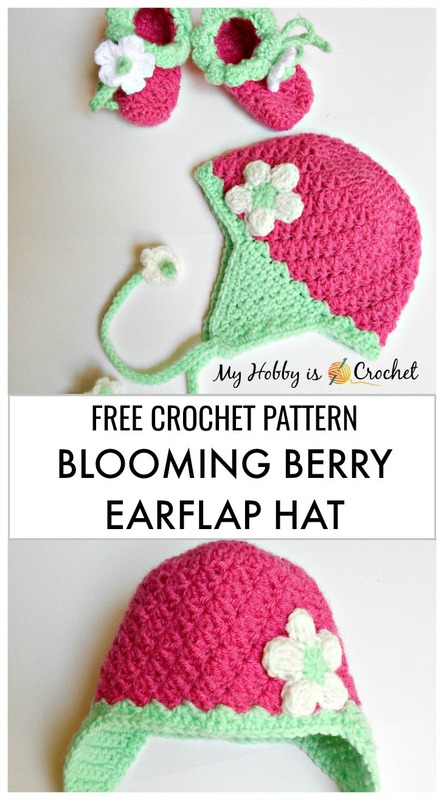 At followers request I designed this crochet baby earflap hat to match the Blooming Strawberry Baby Booties, that I have previously designed for my baby girl. 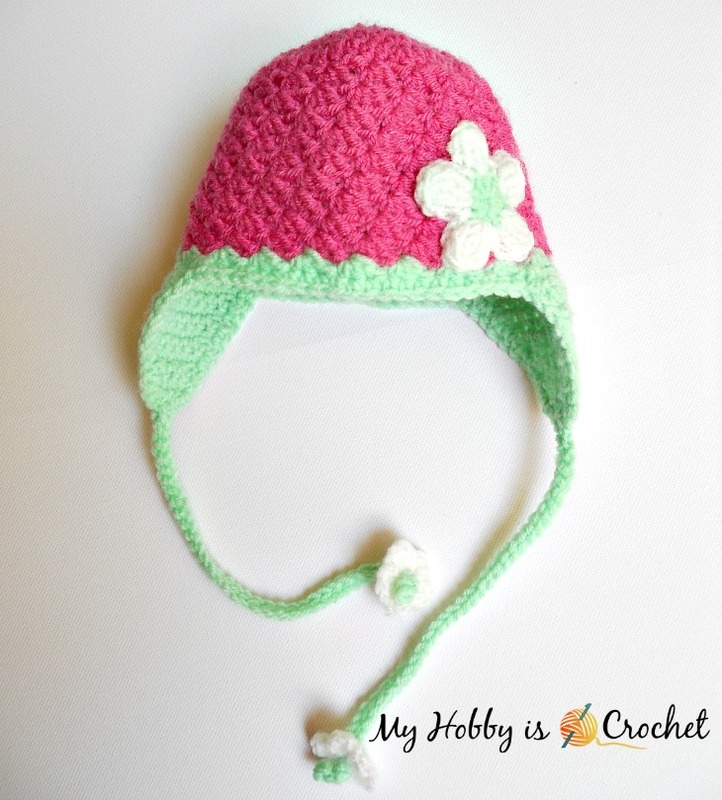 This cheerful and bright baby hat was my favorite for my little one to wear during her first 3 months! She looked so cute wearing it! I hope that you will enjoy this sweet little hat as much as I do! SIZE: 38 - 40 cm circumference, to fit a 0-3 mo baby. Please use my affiliate links below to buy your supplies online! Thank you! - sc dec: single crochet decrease. I like to use the Single Crochet Invisible Decrease, as shown on Moogly. With hook size 4 mm and yarn color A, make a magic ring. Rounds 9 - 16: Repeat as round 8, at the end of round 15, slip stitch with yarn color B and work round 16 (the last round of shells) with yarn color B, join with sl st into top of first sc. Don't fasten off, continue with the first earflap (this will be the right earflap). The Earflaps are worked in rows, turning the work at the end of each row. Note: Starting with row 4 don't ch 1 at the beginning of the rows without decreases, start the rows directly with sc into first st; this will make the edge more even. The rows with decreases will start with ch 1. Holding the hat with the right side facing you, skip the next 7 shells to the left of the first earflap and join yarn color B into the sc st of the 8th shell. Work the second earflap the same way as the first one. Cut yarn. Fasten off. Between the earflaps you should have 7 shells at the front and 5 shells at the back of the hat. Start with a standing single crochet at the middle back, work sc stitches around the hat and earflaps, with 2 sc sts in the corner stitches at the top of the eaflaps. Cut yarn. Fasten off invisibly. Join yarn with a sl st in the middle top of the earflaps. Chain 39, turn, sl st into 2nd ch from hook and sl st into each ch across, sl st back into top of earflap. Cut yarn. Weave in the ends. With yarn color C and hook size 4 mm, make a magic ring. You will work all the petals directly into the magic ring. * ch3, work dc2tog, ch 3, sl st into ring *, repeat from * to * 5 times for 5 petals. Cut yarn. Fasten off. 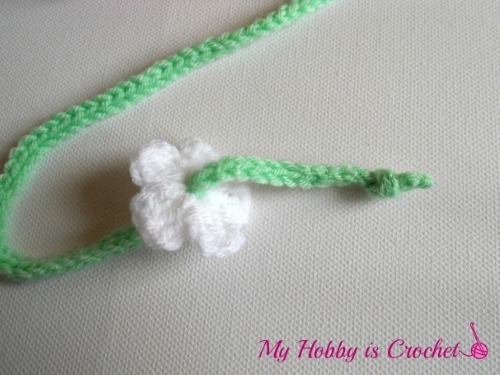 Pull yarn end to close the magic ring, leaving a small hole in the center of the flower to insert the tie through it. After inserting the flower on the tie, make a small tight knot at the end of the tie. (This will be center of the flower!) Secure the flower on the tie sewing a few stitches back and fort. Cut yarn. Fasten off. Flower center: With yarn color B and hook size 4 mm, make a magic ring. Ch 1, work 10 hdc into ring; sl st into top of first hdc. Cut yarn. Fasten off. Petals: Join yarn color C with a sl st into a hdc of the flower's center. * ch 3, tr3tog in next st, ch 3, sl st into next st *, repeat from * to * 5 times. Cut yarn. Fasten off leaving a long tail and sew the flower on the hat, stitching into the chain stitches around the petals. 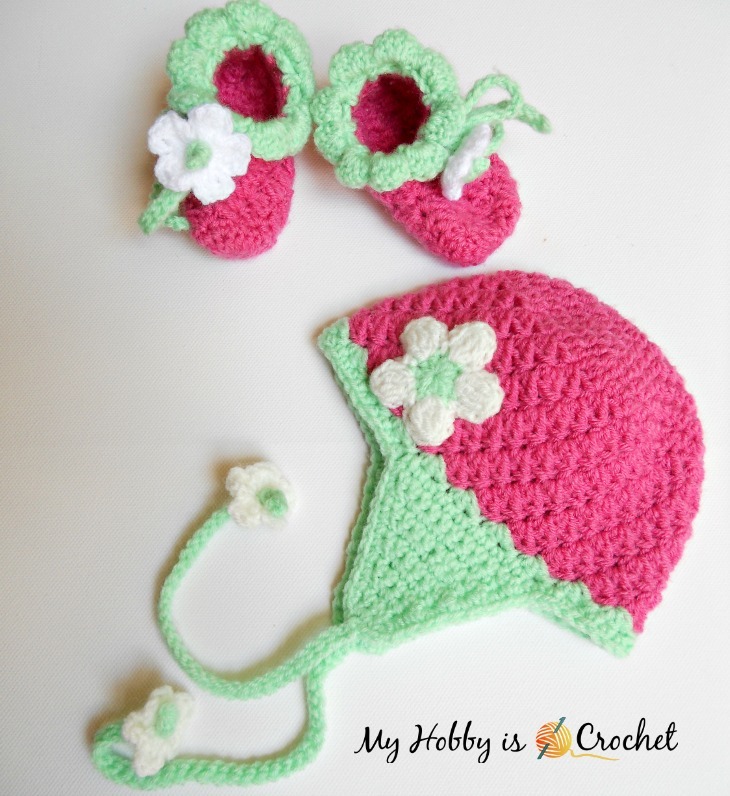 Matching Booties and Mittens are available also, to complete a beautiful blooming berry crochet set for the little ones! The matching baby booties can be found here! And the matching mittens here! I would love to see your creations made using this pattern. 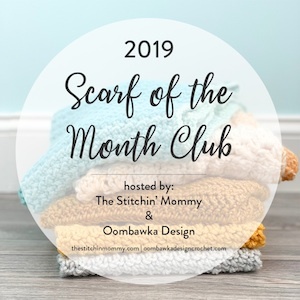 Please share your pictures on my Facebook Page Myhobbyiscrochet. Thank you!